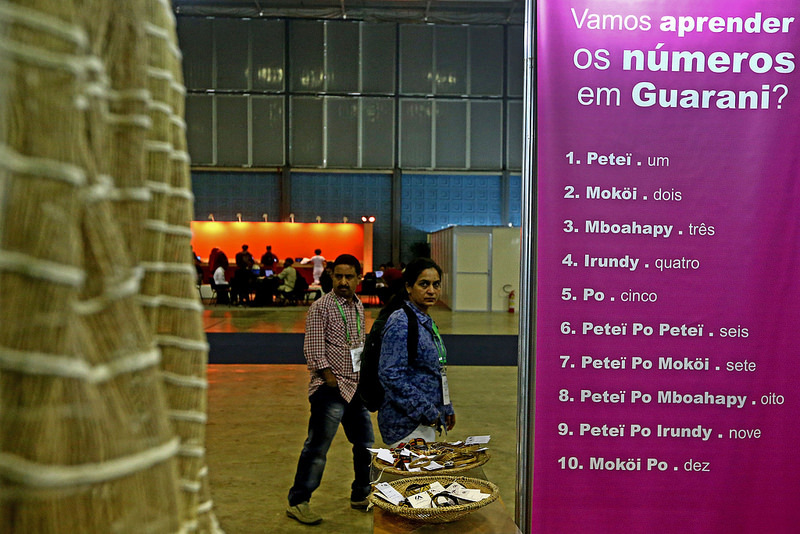 At the Indigenous Museum stand at ICM 2018, Guarani museum representative Alberto Álvares explains how in the Brazilian Guarani language, instead of using ten as a counting measure, they count to five. Several cultures deviate from the dominant 10-based counting system, especially in the higher numbers. The French switch to a twenty-based system after 70. In Danish, counting after fifty involves multiplying fractions. In the Yoruba language, after 10 you add for digits between 1-4 and subtract for the rest. In a more extreme case, the Oksapmim people of New Guinea use a 27-based system based on 27 different body parts. An association from the United States of America called The Dozenal Society advocates for a 12-based counting system. Álvares explains that to figure out how to say 100 in Guarani, he’d have to do some calculating.